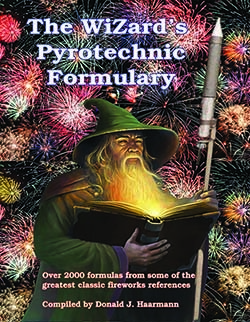 The Pyrotechnic Formulary contains 2,500+ pyrotechnic formulations, this is without a doubt the most complete and exhaustive collection ever published. Includes formulas for every imaginable type of firework and pyrotechnic device; including dozens of formulas for every color, including fireworks recipes for purple, blue, red, gold, green, silver, gold, and dozens of variations in between. You'll find formulas for flash stars, crackle, glitter, strobes, and waterfall fireworks. On the minus side, there is no narrative or how-to information with any of the formulations. A no-brainer reference for any serious pyrotechnician to own, but definitely not a book for beginners. 96 pages. The original for this book was complied in 1996. This year the staff of AFN took that very wonderful raw collection and recrafted it into a very user friendly format, eliminated some redundancies and trimmed the book down to 98 pages. We even gave it a nice cover. This book is a compliment to our formulary compilation catalog M100. We put together all the newer formulas from 1996 to date. You need to get both to get all the available formulas in on location.